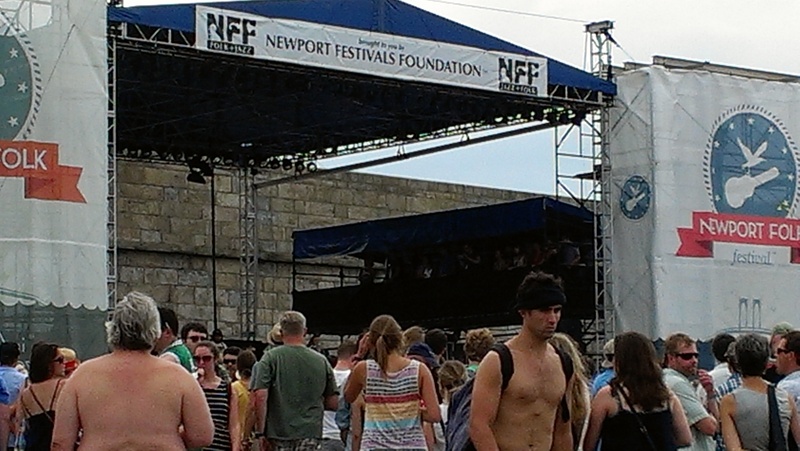 This past weekend my husband and I took a trip up to Rhode Island for The Newport Folk Festival. It also gave us a chance to spend a few days visiting my husband’s older sister, who lives in Narragansett and whom we hadn’t seen in awhile. Though it’s something I’ve wanted to attend for a couple years, this was my first time at the festival and I enjoyed it so much I’m already plotting my return for next year much to my husband’s chagrin I’m sure. This kind of thing isn’t really up his alley, but luckily he’s willing to go along with many of crazy schemes even if it’s something he would never choose to do on his own. The festival starts Friday evening and runs through Sunday night, though we just went Saturday and Sunday. The festival is held at Fort Adams in Newport, which I must say serves as the most picturesque place I have ever attended a concert. It’s right on the water looking out at the Newport bridge. Lots of people who own boats pull themselves up next to the fort so they can listen to the music, at least the music coming from the main stage. Fort McHenry in Baltimore should really get on this and start doing something similar. This year there were 4 stages, plus the Kid’s tent and some other little nook where a lot of the acts went and played more intimate sets. The latter two stages weren’t scheduled but you could follow the festival on Twitter to get alerts about who was going to show up in various places at various times. You could spend your time running around trying to get as much music as possible crammed into every second possible if you wanted, but we mostly just camped out in front of the main stage for both days. Most of the acts I wanted to see were scheduled there, and it seemed too stressful to be running around trying to catch bands all over the place. I just used the 20 minutes or so between each act on the main stage to do stuff like get food and go to the bathroom. The one exception I made was on Sunday when I ran over to see Of Monsters and Men on one of the other stages. The festival was all very civilized as one might expect from Newport, which was something I much appreciated having gone to other outdoor concerts and music festivals where that was not the case. I am not a huge lover of crowds, so I really was kind of dreading dealing with the 10,000 people crammed into the fort each day. However, it was much better than I anticipated. Even though it was all first come, first serve lawn seating people were very respectful of space. You could park your blankets and chairs in a spot and leave them there all day even leaving them unattended for long periods of time while you moved to other stages and no one would bother them. I think part of the reason it never got unruly is that the alcohol is very segregated. Although you’re allowed to bring in food and drink, alcohol is prohibited and that they do sell at the festival has to be drunk in one of the two beer gardens. I’m sure there were some people who smuggled stuff in and I definitely smelled/saw people smoking pot on more than one occasion, but definitely the majority of the people were just there to enjoy the music. It also made it very family friendly. There were tons of people with kids there. Despite the large number of people it never seemed overly crowded to me and the few lines I had to stand in for food or the bathroom all moved very quickly. The best decision we ever made in avoiding lines was actually the way we got to the festival. 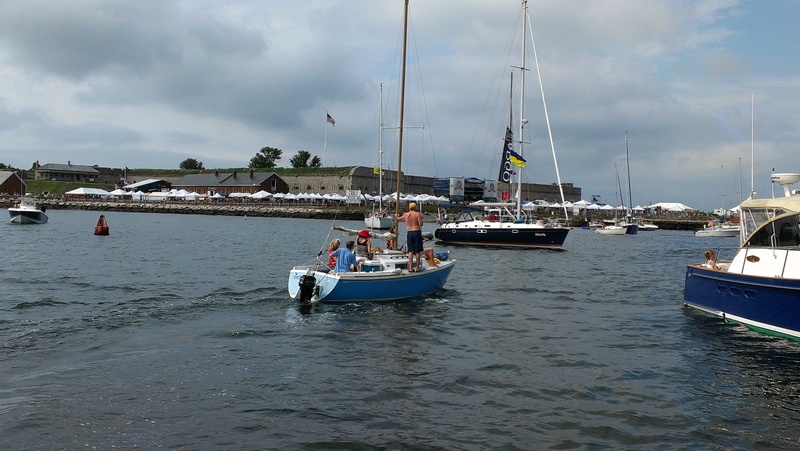 Your major options are to bike or take a ferry from Newport, drive through Newport to the fort, or take a ferry from Jamestown. My husband’s sister offered to drop us off and pick us from the Jamestown ferry. Though it is by far the most expensive option for getting to and from the fort at $18 per person per day it was worth every extra penny. It drops you off right at the entrance of the festival unlike the parking lot, which is apparently a bit of a trek. Plus, not that many people take the Jamestown ferry because unless you live there or have someone to drop you off there’s nowhere to park for that length of time. We pretty much walked right onto and off of ferries at both ends each day. On the other hand we heard nightmare stories of people waiting in their cars for 2 hours to get out on Saturday night, and the line for the ferry to Newport was taking people about 1 1/2-2 hours to get through as we heard when some poor people on our ferry back Sunday night didn’t realize there were separate lines for Jamestown and Newport until they waited for 2 hours to get to the front of the line only to be told they were in the wrong place. If you have a way to get yourself there, the Jamestown ferry is definitely the way to go. A random aside about the ferry, on Sunday morning we got on the boat and I looked over and saw one of my friends from high school with her family. I haven’t seen her since we graduated 16 years ago, so that was crazy. Her husband is in the Air Force and they’re living in Jamestown for a year. It was entirely random but awesome, and great to catch up with her in person for a few minutes rather than just over Facebook. The weather for this year’s festival wasn’t perfect, but it could have been much worse. Saturday started out hot and humid, but a couple of hours into it the clouds rolled in, which did make it cooler but also portended rain. We had our eye on the radar and chose to leave earlier than planned Saturday due to impending thunderstorms. We got back to the house right as it started to rain, so it was a good call even though I was disappointed to miss City and Colour. Sunday it was cloudy all day long, which kept it cool. We didn’t avoid the rain on Sunday though. It held off for a good long time, but we spent Jackson Browne’s set in the rain. It was okay though because we came prepared with ponchos and an umbrella plus a garbage bag to keep all of our stuff dry. The only thing that was wet were my feet. Now on to the music that I saw at Newport Folk. If you weren’t lucky enough to be there yourself, if you missed a band you really wanted to see or you just want to relive one that you did NPR Music recorded a number of the bands during the festival, which you can access in their archives. Here’s a list of the bands I saw during the festival with links out to a song by them in case you’re unfamiliar and want to check them out. Brown Bird is a local Rhode Island band. I had not heard of them before seeing the line-up for Newport Folk Fest. I liked their music ok. I preferred the stuff that sounded more folk/bluegrassy to me as opposed to the stuff that in my mind at least I think of kind of as gypsy/Greek music. Last time I saw The Preservation Hall Jazz Band I was in fact at Preservation Hall in New Orleans. It’s a slightly different experience seeing them on a large festival stage compared to the intimate location of Preservation Hall. Alabama Shakes was the first band on the main stage to get pretty much the entire crowd on their feet. They’re definitely more blues than folk, but I was super excited to see them play live for the first time. Dawes was a lot of fun and great to sing along with. I think Patty Griffin was the most folk-like artist who performed on the main stage on Saturday. She has such an extensive catalog of music that I was afraid she wouldn’t play the songs I wanted to hear, but she did play a couple of my favorites including Making Pies. Sunday started out with a short set from the Sleepy Man Banjo Boys, which features some incredible picking by 3 brothers who are only 15, 13, and 10. I used to love Nickel Creek, but never really knew what happened to their members after they broke up. Somehow I never made the connection that Sara Watkins was the female member of that group until she mentioned it during her set. Her set was fun because she got members of several other bands out to play with her including Jackson Browne, who she has been touring with. She also played with him during his set. There was also an alert that she was playing some of her Nickel Creek songs in the Kids’ Tent later in the day, which I would have loved to have gone to but it was during the time period in which I was already agonizing over the overlapping sets of The Head and the Heart and Of Monsters and Men. I have some friends that are super in love with Trampled by Turtles, but I was only familiar with a couple of their songs prior to seeing them in Newport. They are a lot of fun and have a lot of crazy banjo and fiddle going on. Again blues, not folk but Charles Bradley killed it at Newport Folk. I’ve written about The Head and the Heart multiple times before on this blog. I was super excited to see them in concert again, and I’ll link to my most recent favorite song of theirs (cause you know it rotates). I was very sad to miss the first part of Of Monsters and Men’s set as it overlapped with The Head and the Heart, but I think I probably only missed two of their songs. They were excellent just as they were last time I saw them live. I didn’t actually see much of Conor Oberst’s set because it overlapped with Of Monsters and Men, and then it took forever getting between the stages because of the tunnel in the fort and the crowd around the Harbor stage in between watching TuNeYaRds (or however you actually capitalize that), but the little I saw was enjoyable. Jackson Browne though the headliner, was actually the biggest disappointment of the festival for me. He played for an hour and half and didn’t include a single one of his hit songs. He did play “Take It Easy”, which he co-wrote, but really The Eagles are the ones who made that song famous. I realize he has a huge catalog of music and would get bored if all he did was play the best of every time he toured. I’m not suggesting that he only needed to play his greatest hits, but it would have been nice to throw a bone to those of us who stood in the rain watching him for an hour and half and give us at least one song to sing along with. I don’t think that’s too much to ask. Oh well. All in all it was a fantastic weekend and I can’t wait to go back again next year. I’ve been loving Runaways, The Killers first single off their upcoming album. It is totally a throwback to those rock songs from the 1980s that were epic tales of a couple once burning bright but then ending up hating each other. I’m thinking of songs like Meatloaf’s Paradise by the Dashboard Light and Billy Joel’s Scenes from an Italian Restaurant, Bruce Springsteen’s Brilliant Disguise, and Bon Jovi’s Living on a Prayer (though that one doesn’t end badly). This song has such tones of that both lyrically and musically that the first time I heard it I was convinced that it was some song from the 80s that I had somehow just missed, but when I went online to look up what it was I discovered it was in fact by The Killers, which obviously meant it wasn’t from the 80s at all. I feel like it’s not the kind of song that is really being written these days, so I’m quite enjoying it just as I loved all the songs that seem to have influenced it. Pitango Gelato opened their first shop in the Fells Point neighborhood of Baltimore. They have since expanded adding 3 shops in Washington D.C. and one in Reston, Virginia. They sell organic authentic Italian style gelato and sorbet. They have truly spoiled me for all other gelato. Whenever I wind up eating gelato from somewhere I else I inevitably wind up thinking nope not as good as Pitango. Whenever I am down in Fells Point I have to stop in for some gelato. Yesterday was a cool, rainy summer day in Baltimore. As all the plans I envisioned for my weekend involved being outdoors we wound up meeting up with some friends at Max’s Taphouse for the afternoon. Since Max’s is across the square from Pitango, I also knew this meant there was some gelato in my future. My husband will often use Pitango as an incentive to lure me down to Fell’s Point if there’s some reason he wants to go down there. Their pistachio flavor is my favorite, so I always get that. What I pair with it varies. One of my favorite combinations is pistachio and cardamom. They haven’t had any cardamom the past several times I’ve been though. Instead I’ve recently been getting half pistachio half black tea, which is also an excellent combination. I’ve never tried any of their sorbets because I’m much more partial to gelato than sorbet, but I hear it is excellent as well. If you’re ever near one of their locations I highly suggest that you stop in and treat yourself to an excellent frozen dessert. It’s time for another musical interlude here on More Than Meh. It’s been far too long since I’ve written anything about music here. I previously wrote about Ho Hey, The Lumineers’ first single off their self-titled album. I still count that as my favorite song of 2012 so far, but their new single Stubbon Love is not far behind. It was featured over the closing scene on Covert Affairs the other night. My husband and I happened to be watching in different rooms, but when it was over he came upstairs and said you like that band don’t you. He was not wrong. He of course had no idea who it was and had never knowingly heard the song before, but he knows the kind of music I like. It amused me. I would love to see them in concert, but that does not appear to be in the cards any time soon. It’s not because they aren’t playing near me because they are, it just never seems to align with my schedule. They played at a club in Baltimore the day before I returned from my trip to Arizona. They’re playing the XPNontial Music Festival in Philly this weekend, which I totally would have gone up for given that as a member I can get super cheap tickets, but their set is tomorrow night at 6, and there’s no way I can make it up there in time after work. They also opened for Brandi Carlisle at Wolf Trap while I was in Arizona. Missing that show is the most disappointing because I love Brandi Carlisle as well as The Lumineers and Wolf Trap is my favorite concert venue ever. I guess we are not destined to share the same space in person any time soon, but I’ll enjoy their music over my personal speakers in the mean time. I should probably just write a post about my KitchenAid mixer since it is the most fantastic thing I own living in my kitchen, but I’m going to concentrate on the ice cream maker attachment at the moment. I don’t remember how I even found out about the existence of this attachment, but decided it was something I needed to register for when I got married. It’s the only attachment for my mixer that I own though KitchenAid has an abundance of them. Most of them I figure I would never wind up using. Although I only make ice cream in the summer, and thus only wind up using it a few times a year it was definitely worth getting. It’s super easy to use. I just have to make sure to toss the bowl in the freezer 24 hours before I want to make ice cream (which is the only drawback because I can’t just make ice cream on a whim) then pop the bowl onto my mixer and 20 minutes later voila ice cream! 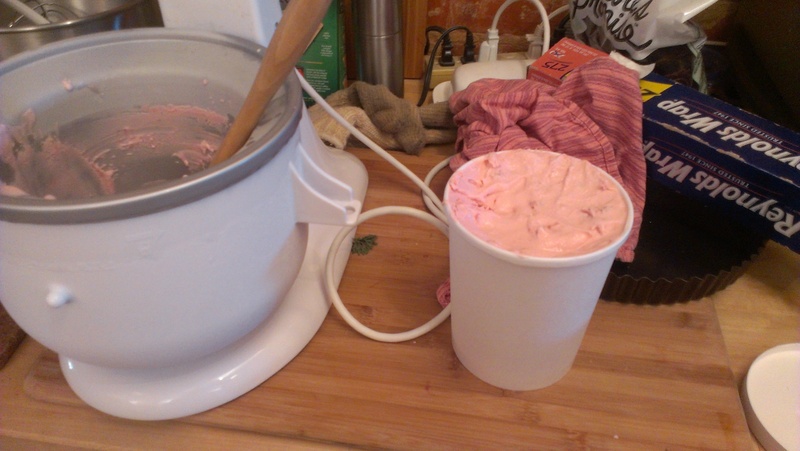 It’s much easier than the old ice filled ice cream maker we had when I was a kid. Thin Mint, and this cookies and cream. I used the same base recipe for the Thin Mint and cookies and cream just replacing the oreos with Thin Mints and the vanilla extract with peppermint extract in the Thin Mint ice cream. 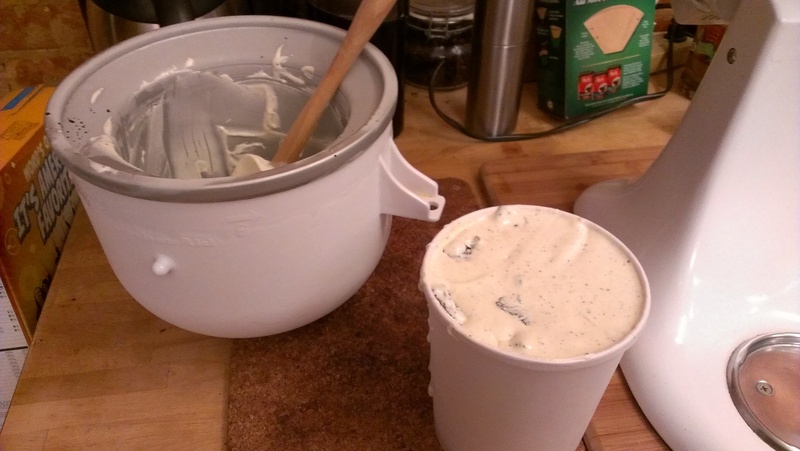 This was the first egg based ice cream recipe I have tried. We never used an egg based batter for ice cream when I was growing up and in reading the recipes I always felt like it was going to be difficult to temper the eggs without accidentally cooking them. I finally got up enough nerve to try it out this year. It’s definitely more time consuming than making a non-egg based batter, but it wasn’t that hard. I do need to try some different recipes though because although the flavor of this one was good, it didn’t freeze well enough and the ice cream was always kind of melty. I have a recipe for grilled peach ice cream that I think I’m going to try next now that peaches are in season. If you have a KitchenAid mixer and you like ice cream I definitely recommend investing the money for the ice cream maker attachment. Yesterday we spent the day up at our friends’ house celebrating a birthday. It was a great day hanging out with some of our oldest friends in Baltimore. Our friends have a pool at their house so we got to spend some time chilling in the water. 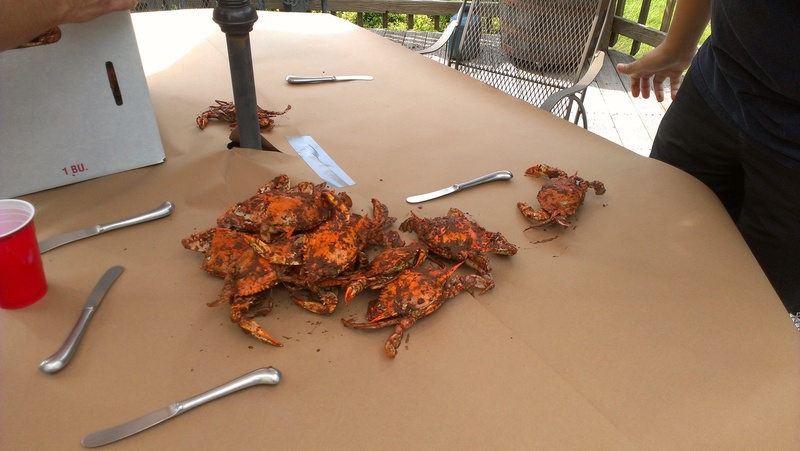 We also picked some crabs, and you know how much I love my Maryland crabs. These little guys met their tasty, tasty fate in my belly yesterday. We also hung around long enough to light up the fire pit and roast some marshmallows and eat s’mores. It was a great summer day spent with great friends. This morning I was thinking about how much has changed since we all first met about 8 years ago. Most of us were in in our mid-twenties and single, and today most of us are now married. Our circle has also expanded by adding some kids to the mix with more on the way. We used to spend our time out at bars staying out until all hours. Now we’re more likely to hang out at someone’s house and call it a night by 9pm. We also don’t get to see each other nearly as often. I remember hanging out 3, 4, or possibly even more nights a week with these people when we were much younger and going out on a “school night” didn’t seem like a big deal. Now we’re all old and tired with other obligations in our lives and we’re now lucky if we see each other once a month. Life moves on, but good friends move along with it. Our friendship might not look the same as it did almost a decade ago, but I still feel wonderfully blessed to have these people in my life and look forward to all the wonderful things life has in store for us in the future. I usually don’t review books on this blog since I still post them on my old blog and in Goodreads, but I loved this book so much that I wanted to post about here too. Plus I don’t think to many of you actually read my reviews in other places so you won’t have to see it twice (or thrice). I loved this book so much that I have anxiously been awaiting the chance to even sit down and write a review of it. I’ve enjoyed Ribon’s previous three books, but I definitely think this one is my favorite. Before I get into the review indulge me in a metaphorical tangent about why I liked this book. This book can be classified as women’s fiction, which is generally an indication to me that I should avoid it as far too often I find that it means I’m getting a romance novel or so-called “chick lit”. I’ve never cared about romance novels in which the whole story revolves around a girl getting a guy. It’s just not my thing. The only romance novels I read are the ones written by my mother. Filial obligation and all that. “Chick lit” books seem to either be about girls mooning ridiculously over guys and shopping like in Bridget Jones or spineless girls who can’t stand up to horrible bosses/friends like in The Nanny Diaries or The Devil Wears Prada. Either way they make me feel stabby. None of this is to condone people who enjoy these books, they’re just not my bag. I do however enjoy a good romantic comedy movie. I only bring this up because my mother doesn’t understand how I can hate romance novels and chick lit but like romantic comedies. I’m not sure I have a good explanation, but I can tell you that You Take It from Here, despite not actually being a romantic comedy, pushes all the same buttons for me. You Take It from Here is not a high work of literature, but it is completely satisfying. I liken it to the Dairy Queen ice cream cone I insisted on getting for dessert following the fancy pants meal at the restaurant where I got engaged. The meal was reading a Pulitzer Prize winning novel while You Take It from Here is the equally as satisfying but for completely different reasons DQ dessert. The story (hey look at that I’m finally actually going to talk about the book for real) revolves around long time best friends Danielle (whose name I have a surprisingly hard time remembering given that it’s my own) and Smidge. When Danielle returns home to Louisiana from LA for the annual trip she and Smidge take together she finds out that Smidge has terminal lung cancer and would like Danielle to take over her life, raising her teenage daughter and marrying her husband after she dies. The book is written as a letter to Smidge’s daughter Jenny detailing the decisions Danielle made to try and honor what might be her best friend’s final wish, which I thought was a lovely detail. It’s a wonderful story about friendship and family. There were some scenes that were so realistic that they almost took my breath away. The characters in this book felt so real that even a week and half after reading it I can’t stop thinking about what is happening to them. I definitely didn’t always agree with the things they did or the way they acted to the point that I wanted to slap both of them at various points, but the characters are so well written that even when their behavior bordered on outlandish I was still able to find it believable. I initially wasn’t entirely happy with the ending because I wanted to know more about what happened to the characters, but I got over that very quickly and decided it was in fact the perfect ending to the story. I can’t recommend this book highly enough. Go read it now. You won’t regret it. I rate it a 9 out of 10.